Did you know that 85% of employees globally are not engaged at work? It takes a moment for it to sink in, doesn’t it? 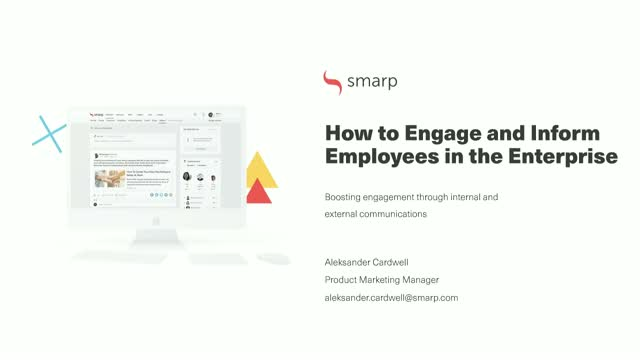 A big part of the engagement issue is how hard it is for employees to stay up-to-date with what is going on with their company and industry. Information gets lost in non-intuitive communication mediums such as email and intranets, and even the information that gets through often isn’t relevant to the employee. That becomes especially relevant in the enterprise sector where organizational complexity can add up to an increasingly disconnected workforce. Join this webinar to find out how to combine both your internal and external communications intuitively in order to boost engagement and performance within your organization. Companies spend lots of time, money and resources creating great content. The problem is this content often doesn't get the attention it deserves. Whether it's an eBook, video testimonial, blog post, webinar, new job post or even sales collateral, when information doesn't flow, engagement is low and well, you know the drill.